1. (Above) A few years back we asked our readers to send us their childhood pictures of them dressed up as witches at Easter. See them and read about the Swedish tradition here! 3. Isabelle´s Easter flowers. In her apartment last year. 4. 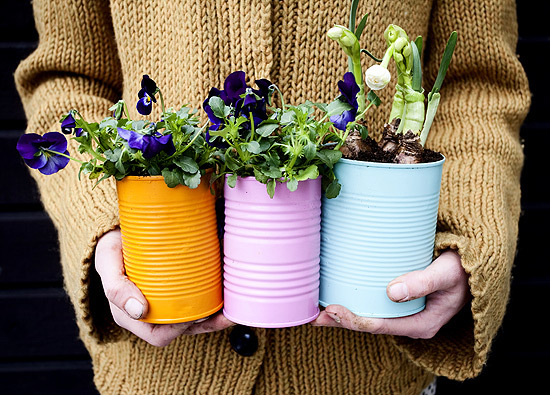 Bring a Gift of Spring A step by step DIY. 6. Give you flowers some support and decorate the support with birds. 7. It is time to get those bird houses ready. Read more in the post Make room for birds. 7. Small signs of easter at my friends house. 9. My spray-painted candle holders makes me think of spring. Colors from Montana Gold Spray cans. 10. Lazy Women´s Easter Decor.